My week has been busy, limited in internet access, no cell phone service and beautiful! Cabo San Lucas, Mexico in December is perfect. (top) view from my room, overlooking the beautiful Hilton resort and Gulf of Cortez blue water. (middle) tech table. 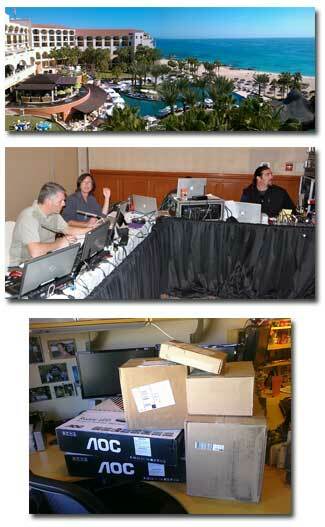 From left: me, Marc, Brian(behind monitors), Gary. (bottom) my desk back home after a week away.